Zika virus infections have been tracked from a pregnant mouse’s bloodstream, across the placental membrane, and into the brains of fetal mice, where damage to neurons was observed. These findings, which appeared in two separate articles—one in Cell and one in Nature—were complemented by a study that indicated fetal mice infected with Zika developed microcephaly. This last study, contributed by researchers in China, appeared in Cell Stem Cell. The Cell article, which was led by scientists based at Washington University School of Medicine, appeared May 11 and carried the title “Zika Virus Infection during Pregnancy in Mice Causes Placental Damage and Fetal Demise.” The article described two mouse models. In one model, the researchers genetically modified mice to lack a molecule called the interferon alpha receptor, which plays a key role in the immune response to viral infections. In the other model, they injected mice with antibodies against the molecule. The scientists infected pregnant mice with Zika virus about a week after conception and examined their placentas and fetuses 6–9 days later. Both mouse models reflected some of the key aspects of human Zika infection. In the mice, as in humans, the virus crossed from the mother's bloodstream into the fetuses and infected their developing brains. Microcephaly—which is marked by abnormally small heads, the most striking result of human infection—was not observed in either model. This may be due to differences in how mouse and human brains develop. “Unlike in humans, a significant amount of neurodevelopment in mice actually occurs after birth, especially in the cerebral cortex, which is the part of the brain damaged in microcephaly,” said the study’s co-senior author, Michael Diamond, M.D., Ph.D.
Indira Mysorekar, Ph.D., co-senior author of the study, and postdoctoral fellow Bin Cao, Ph.D., co-first author, found the virus in the placenta at 1000 times the concentration in the maternal blood, suggesting that it had not just migrated to the placenta, but multiplied there. In the genetically modified mice, Zika infection caused the death of most of the fetuses, and the remaining fetuses were much smaller than normal. The placentas showed damage: They were shrunken, with a reduced number of blood vessels. Such placentas would be unable to supply enough oxygen and nutrients to a developing fetus, a condition known as placental insufficiency, which causes abnormally slow fetal growth and, in severe cases, fetal death. Placental insufficiency, abnormally small fetuses, and miscarriages have been reported in pregnant women infected with Zika virus, as well. The Nature article, which was led by scientists based at the University of California, San Diego, appeared May 11 with the title “The Brazilian Zika Virus Strain Causes Birth Defects in Experimental Models.” The article described how the UCSD scientists conducted studies in mouse models, human stem cells, and in cerebral organoids—miniature brains grown in vivo. Interestingly, not all mouse models tested showed a causal effect when infected by the Zika virus. In at least one strain of mice, the Brazilian Zika virus could not cross the placenta of the mother to infect her unborn pups. The finding, said the study’s co-senior author, Alysson R. Muotri, Ph.D., suggests that in mice—and humans—some individuals may be more susceptible to infection than others, possibly due to genetic differences or varying robustness of the immune system response. 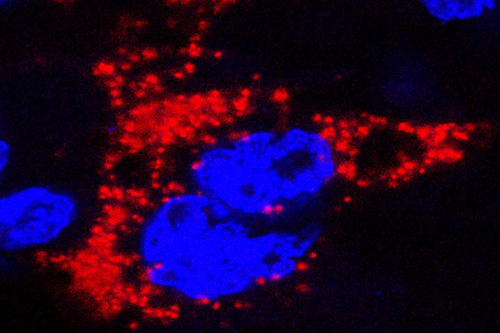 The Cell Stem Cell article “Zika Virus Disrupts Neural Progenitor Development and Leads to Microcephaly in Mice” resulted from a collaborative effort between the Chinese Academy of Sciences and the Beijing Institute of Microbiology and Epidemiology and appeared May 11. The article described a model in which mouse fetuses injected with the Asian Zika virus strain were carried to term within their pregnant mothers. Zika virus was injected directly into fetal mouse brains. If given too early, the embryos didn't survive, so the researchers began by looking at the equivalent of the second trimester in humans, when the fetus's neural progenitor cells are expanding intensively and generating new neurons at the same time. With this model, they could observe as the brain shrunk with the increase in viral load combined with the intense immune response. As expected, the virus infected the neural progenitor cells, and infected brains revealed expression of genes related to viral entry, altered immune response, and cell death. The authors say this is direct evidence that Zika infection causes microcephaly in a mammalian animal model.